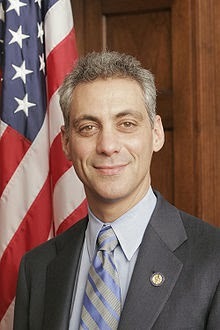 Democrat Rahm Emanuel, the current Mayor of Chicago, formerly served as Barack Obama's Chief of Staff. Before that, he served as a U.S. Representative from Illinois's 5th District. While serving in Congress, Emanuel stayed free of charge in the basement of a Washington, D.C. Townhouse owned by Connecticut Democratic Congresswoman Rosa DeLauro and her husband Stanley Greenberg, a political consultant at Carville Greenberg Schrum. His residency status while serving in Congress became a controversy while he pursued election to the mayor's office. Emanuel also served Bill Clinton as a senior adviser; during this time he became known for his confrontational campaign donation garnering tactics. Called "Rambo" even by his mother, Emanuel is known for being willing to figuratively "throw his own grandmother under a train for a vote". When Bill Clinton was re-elected president in 1996, Emanuel repeatedly stabbed a podium with an icepick while shouting "dead!" and cursing everyone who had supposedly crossed Clinton during the re-election campaign. He is also known for doing threatening things like sending dead fish through the mail, and confronting a Democratic congressman from New York who didn't vote for Obama's budget while he was naked in the congressional gym shower. The congressman left office shortly after. Emanuel studied ballet as a young man, and lost half of his middle finger to a deli meat slicer, which Barack Obama remarked "has rendered him virtually speechless". The character Josh on the television show "The West Wing" may have been partially inspired by Emanuel, as the character is nicknamed "Rambo", although the character is also partially based on Paul Begala. Rahm Emanuel may be a dual citizen of the U.S. and Israel, and is said to possess two different passports. He claims to have served in the Israeli military repairing brakes during the Persian Gulf War of 1991. Some reports indicate that he did not serve. It may be illegal for an American to serve in a foreign military. If it is, Emanuel is a traitor; i.e., literally guilty of treason, a crime punishable by execution. Among the allies of the U.S., none spy on the U.S. more than Israel does, and Israel was recently awarded exclusive deals procuring American surveillance technology, aided by Congressman Robert Ney of Ohio. You may remember him from his valiant efforts to change french fries to "freedom fries" in the congressional cafeteria. Emanuel wants the U.S. to begin a mandatory universal civic "voluntarism" program wherein Americans between the ages of 18 and 25 are enlisted (and also paid) to live in barracks for three months, perform mandatory exercise drills, and learn how to respond in the event of an emergency or crisis. Rahm’s brother Ezekiel is a medical ethicist, and influential in health care policy under Obama. He is known as one of the two major architects of the Patient Protection and Affordable Care Act of 2009, commonly known as Obamacare. Rahm's and Ezekiel's brother Ariel (“Ari” for short) is a Hollywood talent agent whose clientele includes Michael Moore, as well as pornographic actors. The character Ari Gold on the show "Entourage" is based on Ari Emanuel. Benjamin Emanuel, the patriarch of the Emanuel family, was a member of Irgun, the Zionist paramilitary group which was a violent radical offshoot of Haganah, a Jewish paramiltary organization. There have been claims that the senior Emanuel personally murdered 80 Palestinians in the late 1940s during the State of Israel's formative years. Benjamin adopted as his surname the first name of his brother, Emanuel Auerbach, who was killed fighting Arabs. In 1948, Irgun attempted to bring munitions onto the Israeli shore on the ship the Altalena, which was attacked by the Israeli Labor government before it could make landfall. The Altalena was purchased by American Jewish gangster Mickey Cohen, a member of Murder Incorporated, the assassination-for-hire branch of the American National Crime Syndicate, with ties to the Five Families of New York. Murder Inc. once operated out of a candy store in Brooklyn. After the establishment of the State of Israel, Irgun evolved into the political party Herut, which itself evolved into the political party Likud, which today runs Israel and is headed by Prime Minister Binyamin Netanyahu.